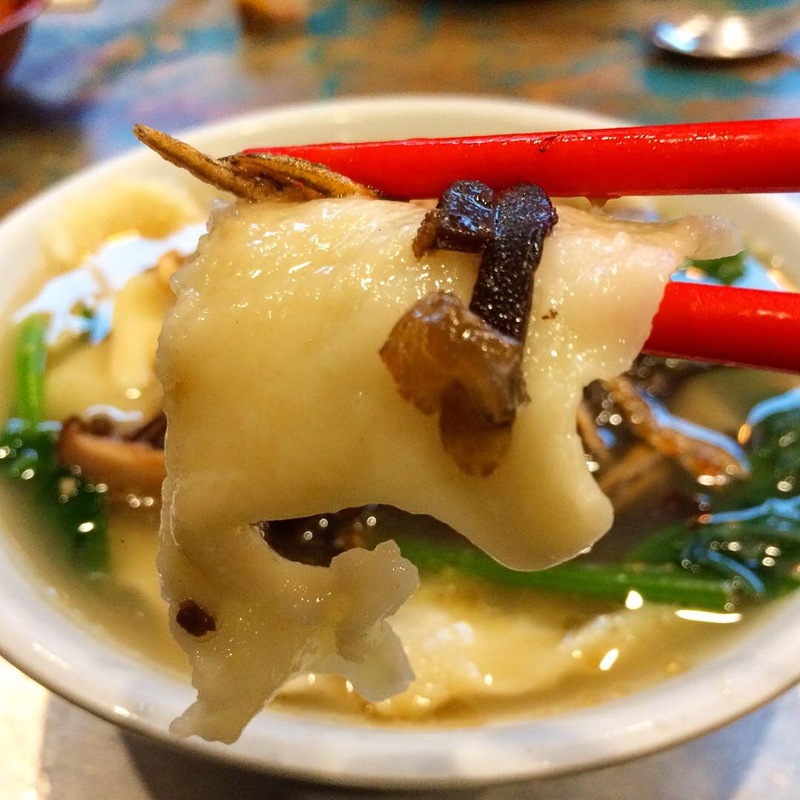 One of the delights of living in NYC is enjoying easy access to our five or six Chinatowns and the culinary treasures they embrace. 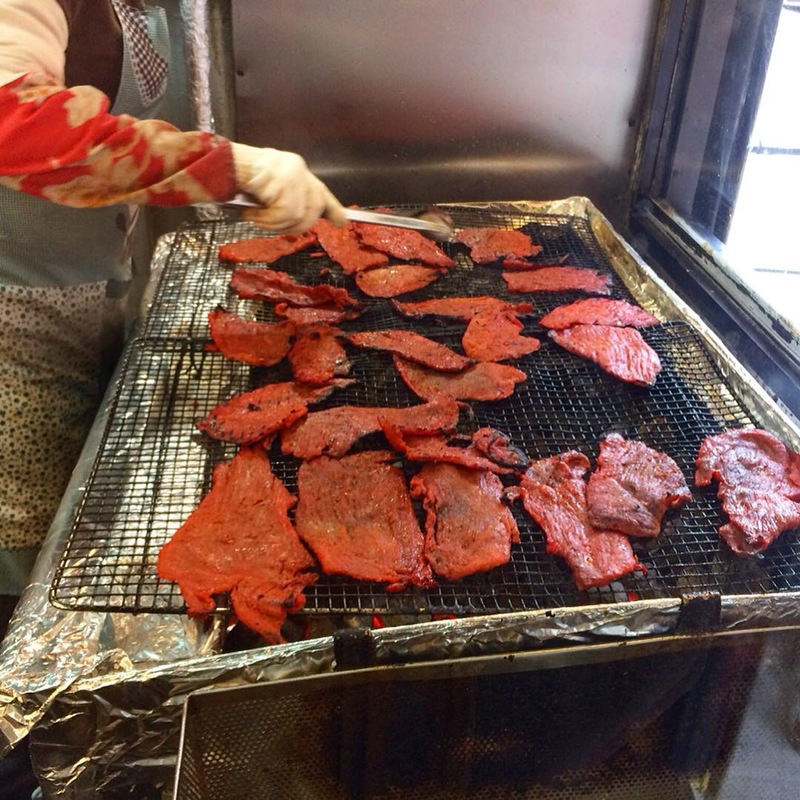 Tucked away at 95A Elizabeth St is Singapore Malaysia Beef Jerky, a tiny shop that delivers big flavor in the form of freshly grilled, delicious jerky – a regularly scheduled stop on my Manhattan Chinatown ethnojunket. 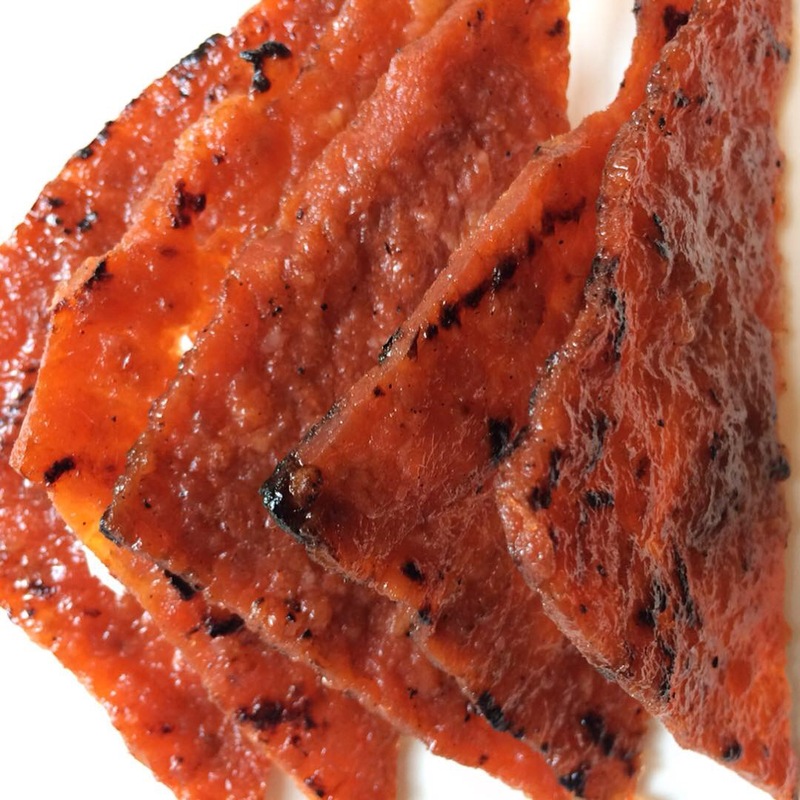 The word “jerky” has its roots in the Andean Quechua language – ch’arki meaning dried, salted meat – and this savory-sweet version is unique. 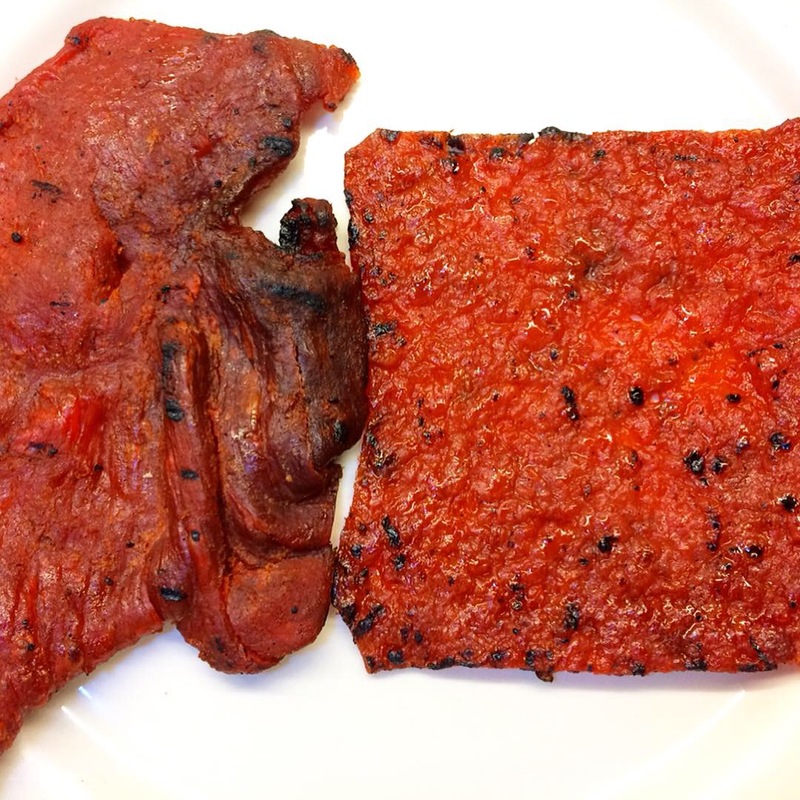 They offer three kinds of meat in two spice levels and two styles. The first style (and my favorite) comes in the form of slightly charred squares of wonderfully seasoned pulverized chicken, pork, or beef. (Sometimes they have a combo of shrimp and pork – if you see it, get it.) The three varieties are similar in appearance: chicken is slightly pinker than pork which is lighter than beef; the flavors are identifiable – if you’re eating one labeled chicken, you know it’s chicken; the texture is supple (chicken is subtly more tender than beef); and their distinctive seasoning blend is the reason to go here. All three are available in spicy as well as regular designations; “spicy” has a finish with a tiny kick, but well within anyone’s tolerance. They also make a style that consists of very thinly sliced meat (pork or beef) with seasoning similar to those above, available in spicy and non-spicy recipes as well. In terms of texture, expect a little more resistance – after all, you’re chewing an actual slice of meat. 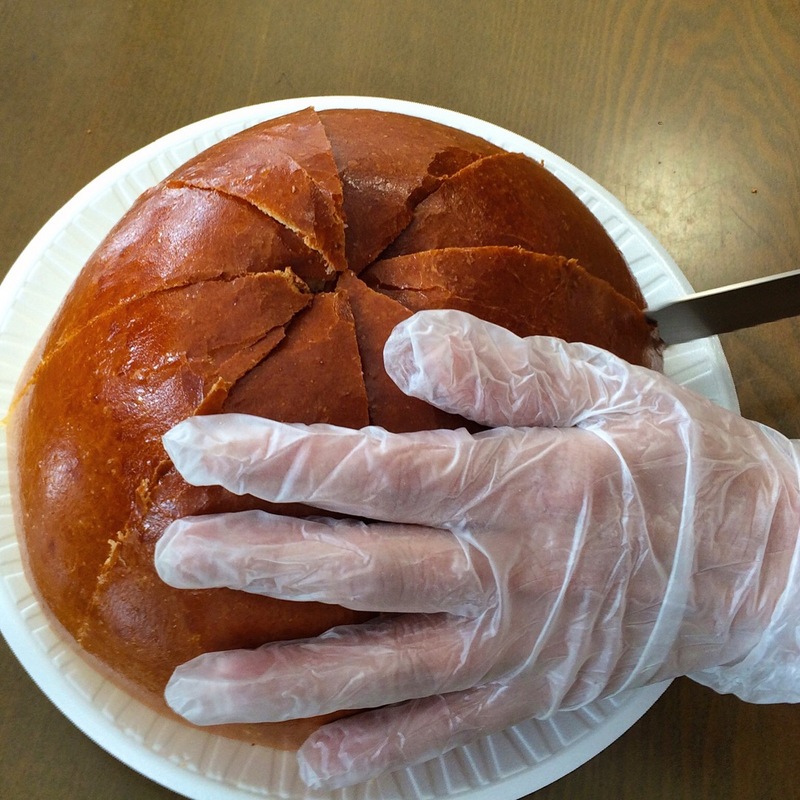 The second photo shows an example of the two side by side. How it’s done. I can attest from experience that this is a universal favorite; if you’ve never tried their jerky, put it at the top of your to-eat list. 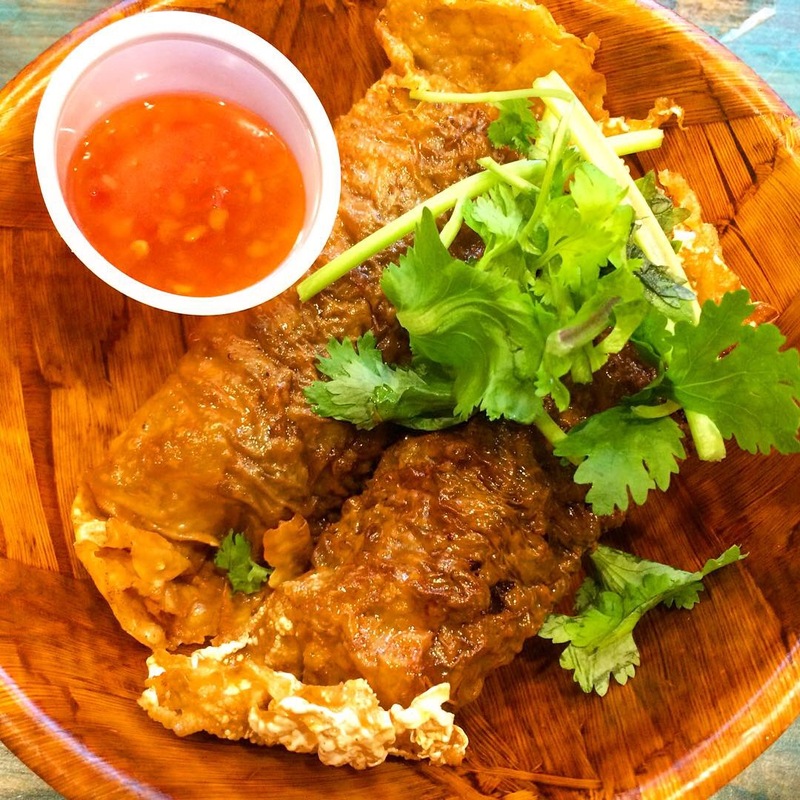 Nonya cuisine came about as the a result of Chinese immigration to Malaysia and Singapore during the 15th through 17th centuries; it’s a happy admixture of Chinese and indigenous Malay cooking with a soupçon of Portuguese, Dutch and British elements tossed in for good measure. Heritage aside, it’s hands-down delicious. 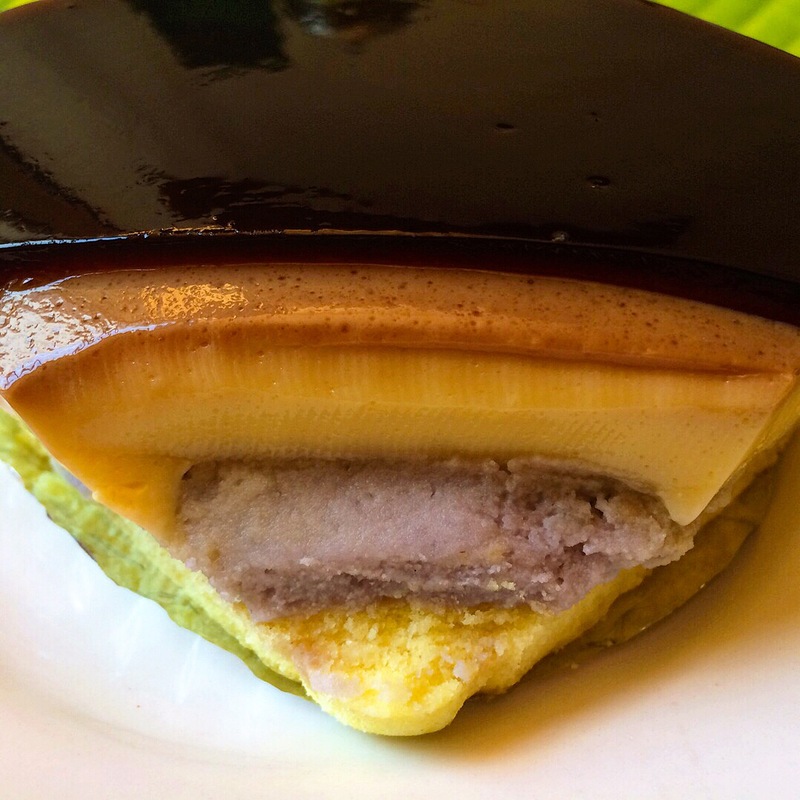 The outstanding Kopitiam (Hokkien for “coffee house”) brings this cuisine to their super casual eatery at 151 East Broadway on Manhattan’s Lower East Side. 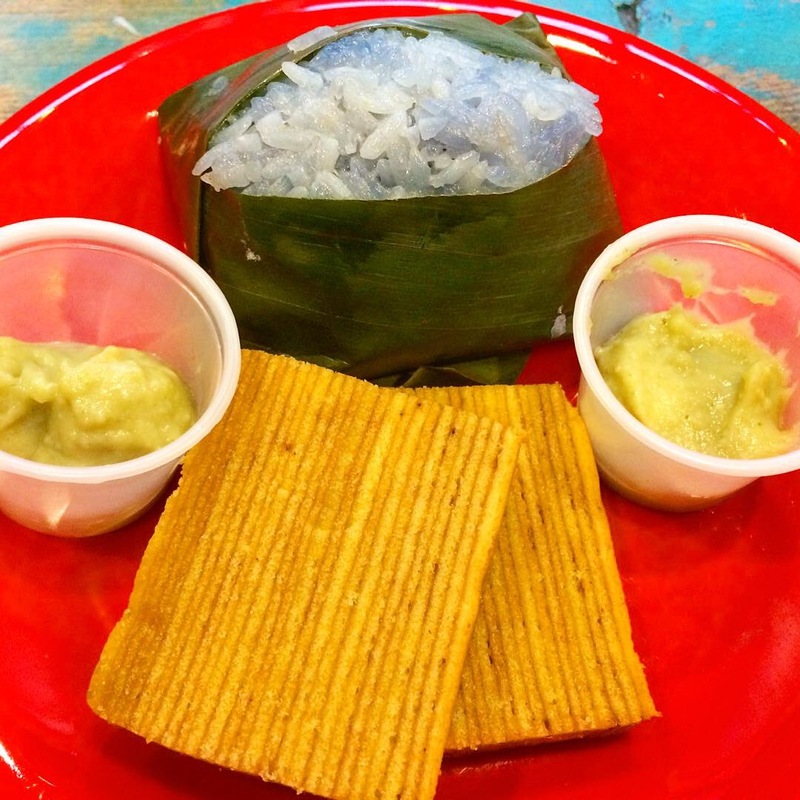 Pandan Chicken – gently seasoned ground chicken formed and swaddled in pandan (aka screwpine) leaf;  denuded. Add the browning maillard effect and the permeating flavor of pandan and you’ve got a perfect snack. 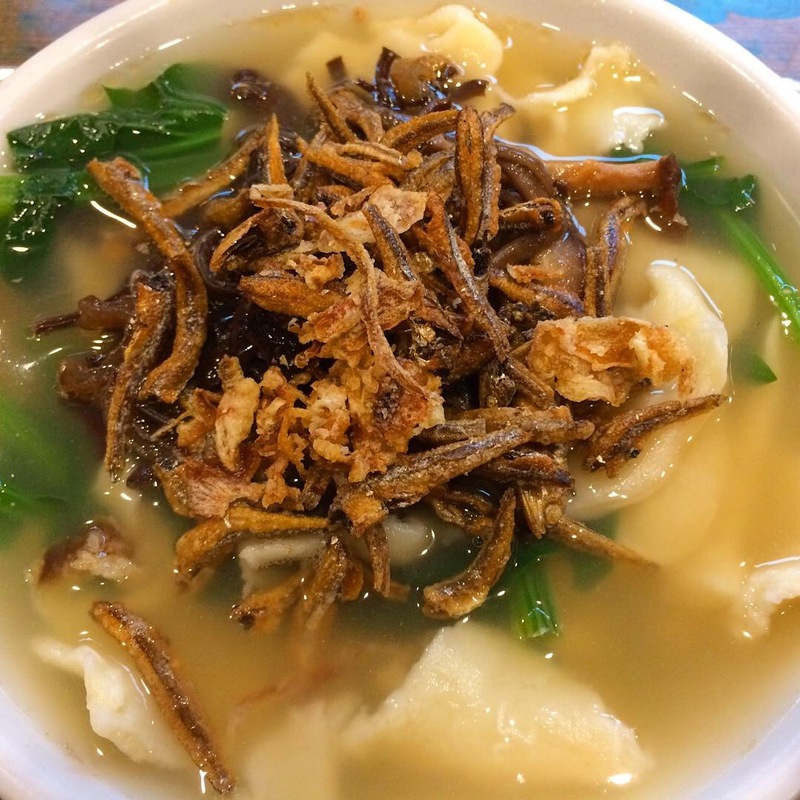 Pan Mee – chewy, hand pulled, roughhewn noodles are the star of this anchovy broth that also features crispy fried anchovies, wood ear mushrooms, spinach, and minced pork;  droolworthy photo. 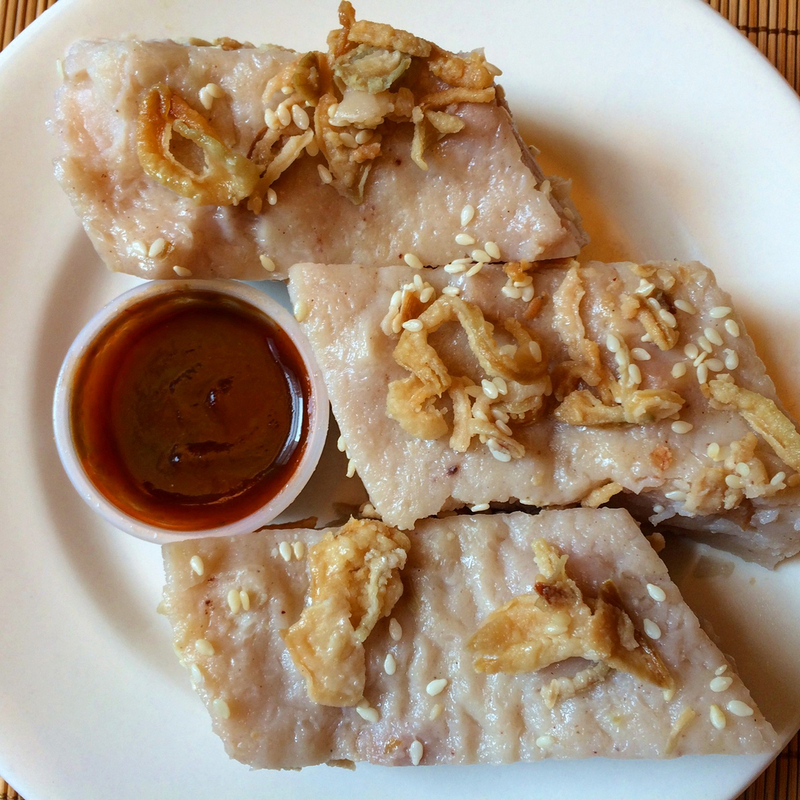 Lobak – Five-spice seasoned pork roll wrapped in beancurd sheet and fried. Gotta love it! 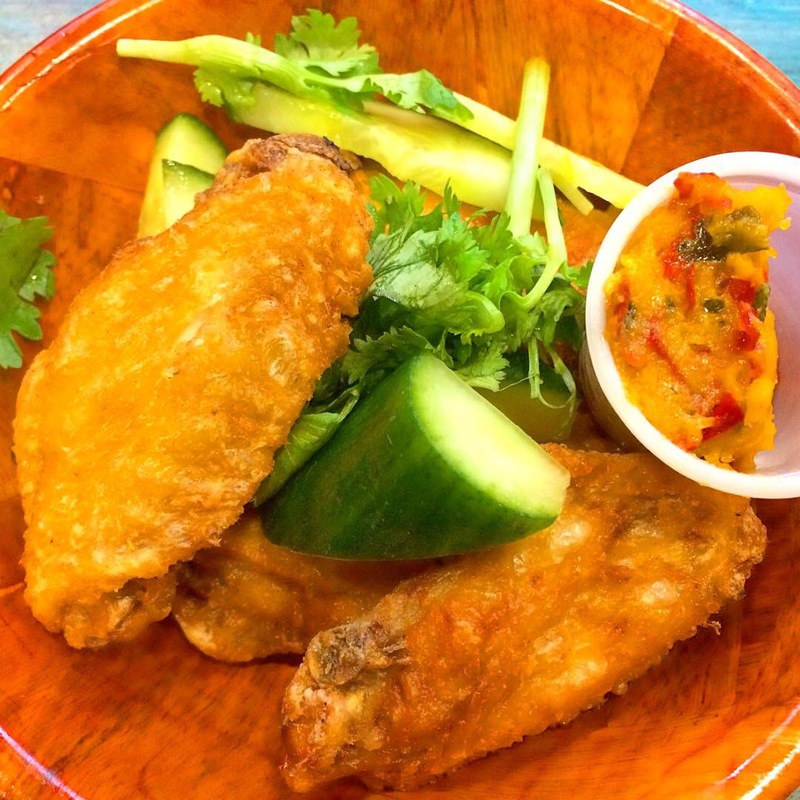 Salted Egg Chicken Wings – Wings are always great, of course, but the salted egg condiment is a flight of fancy that sends this snack over the top. Dessert anyone? Malaysian desserts aren’t overly sweet and these two filled the bill nicely. Pulut Tai Tai (pulut is Malay for glutinous rice) tinted with the suddenly ubiquitous blue morning glory flower (that’s the tai tai part) keeping company with Kuih Lapis, the puffy, thousand layer butter cake touched with cinnamon. 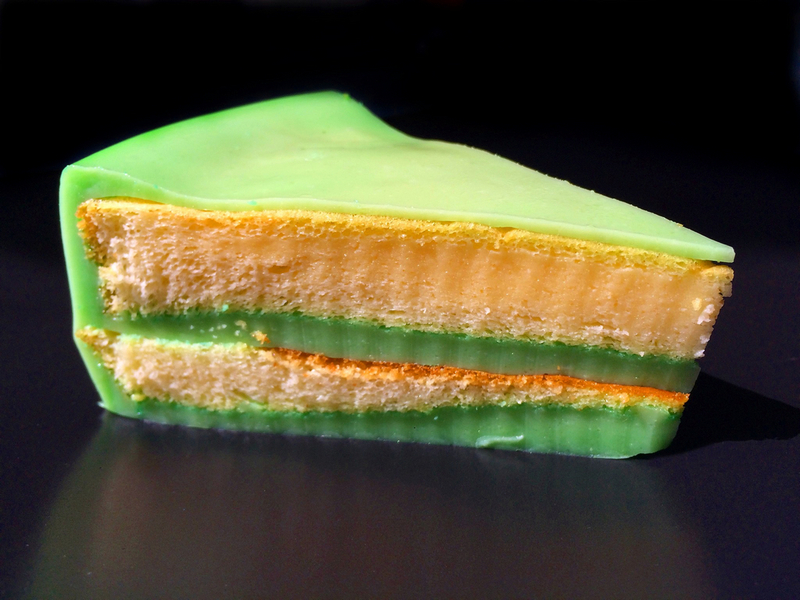 Kuih are bite-sized sweets or snacks (spelled kueh in Singapore or kue in Indonesia) and lapis means layers; kaya (delicious coconut egg jam) on the side. 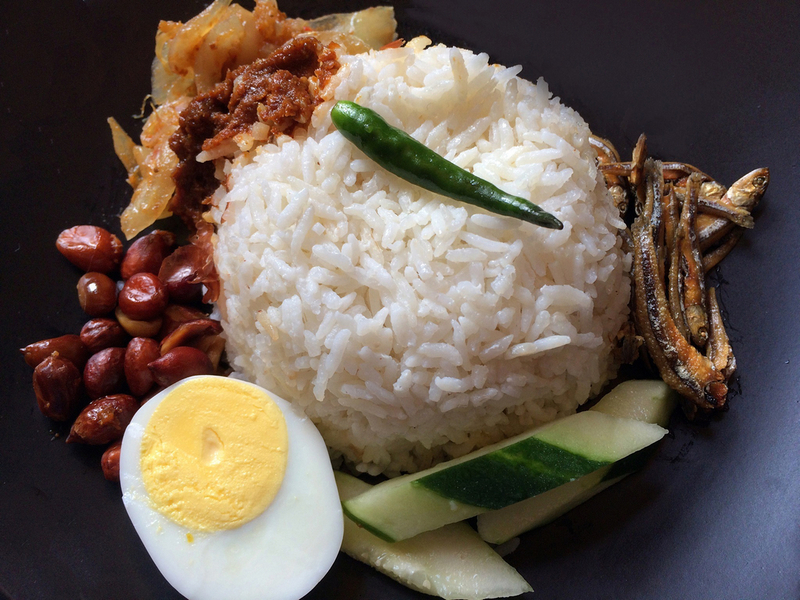 Nasi Lemak: coconut rice with dried anchovies, peanuts, cucumber, onion, sambal and a hard boiled egg; they all manage to squeeze into this Little House snack. 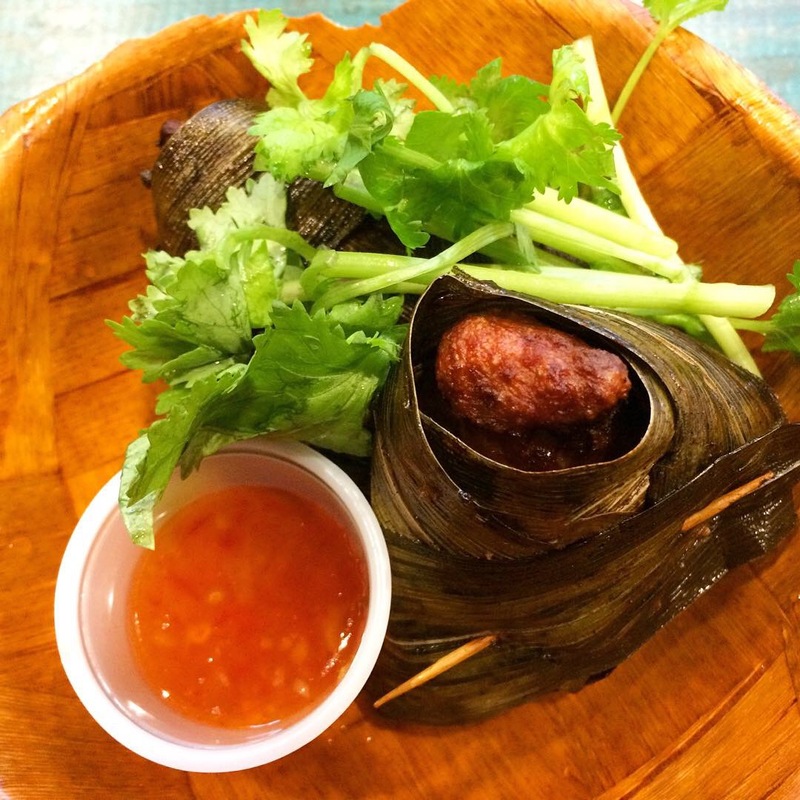 It’s a Malaysian standard and Little House Café, 90-19 Corona Ave in Elmhurst, Queens does it well. 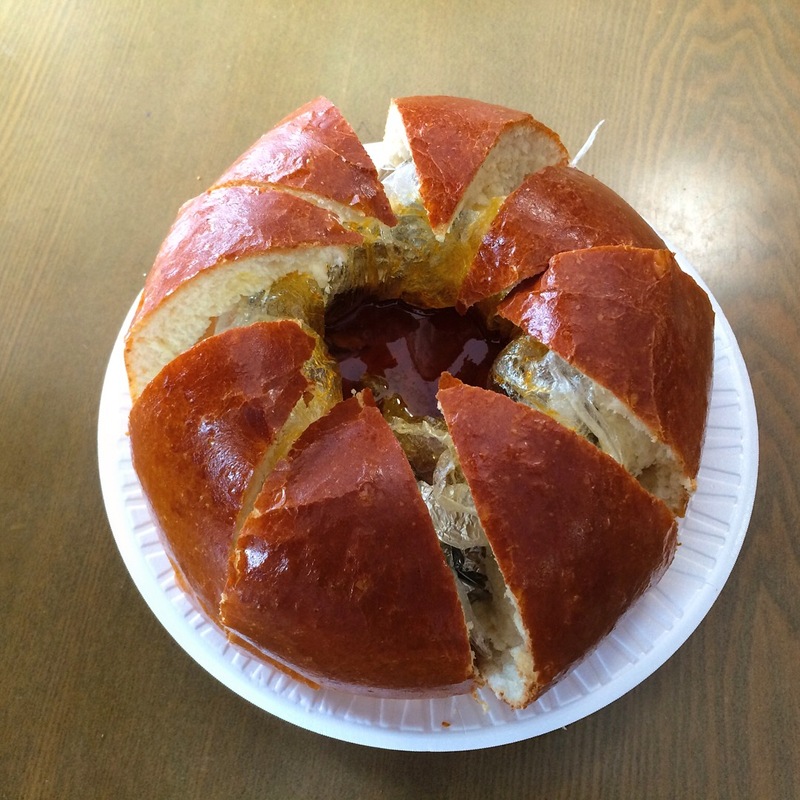 Once again, this treat was available at the grab-n-go prepared food area near the register, but when you arrive, don’t hesitate to sit down, have a look at the menu and order something more substantial. If your experience is like mine, whatever you choose will be great. 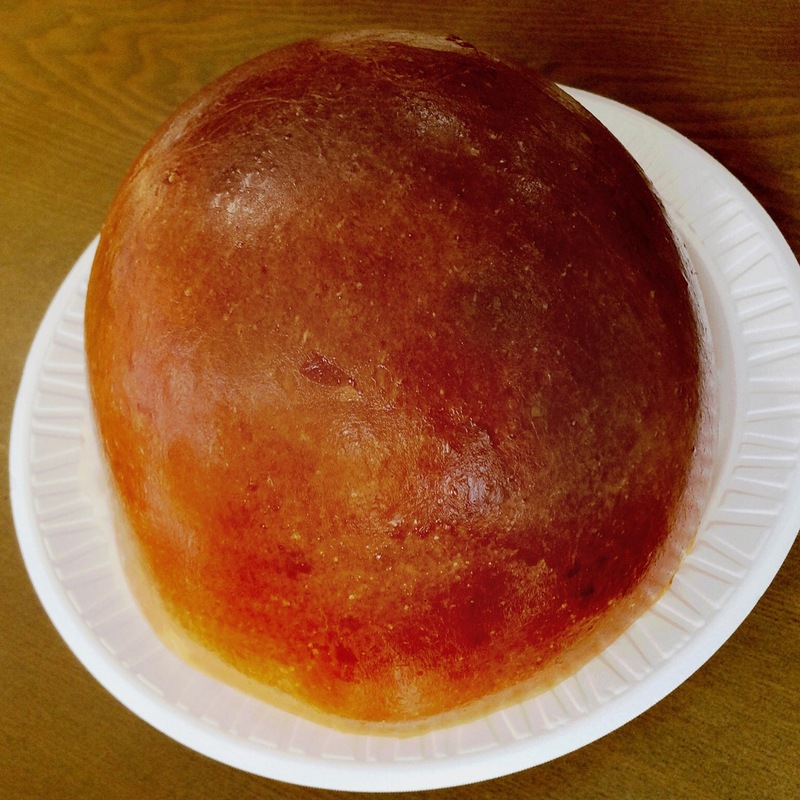 Unlike their sweet layered dessert taro cake that I’ve written about here, this kind of savory steamed taro cake is more akin to the variety you might request at Chinese dim sum. 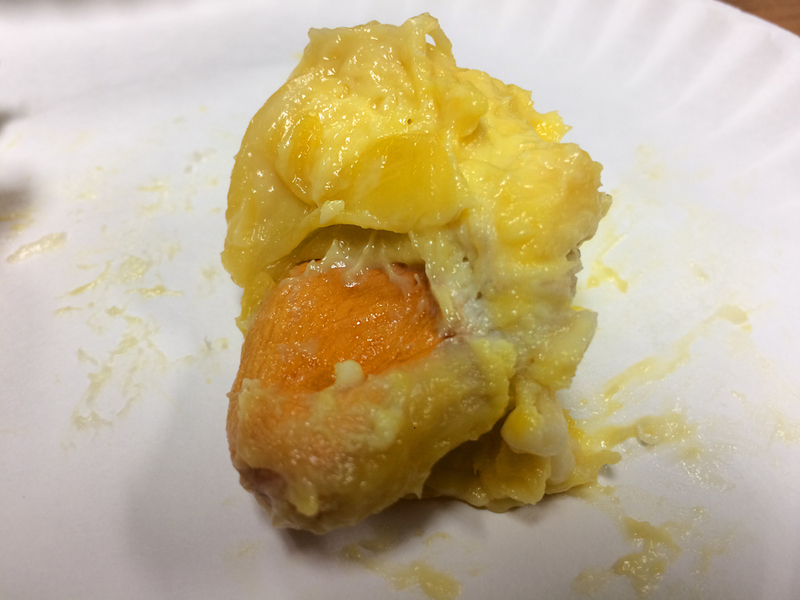 Grabbed from the grab-n-go prepared food area near the register at Little House Café, 90-19 Corona Ave in Elmhurst, Queens, having gone home, I fried it lightly to heat it through. So easy and so good. 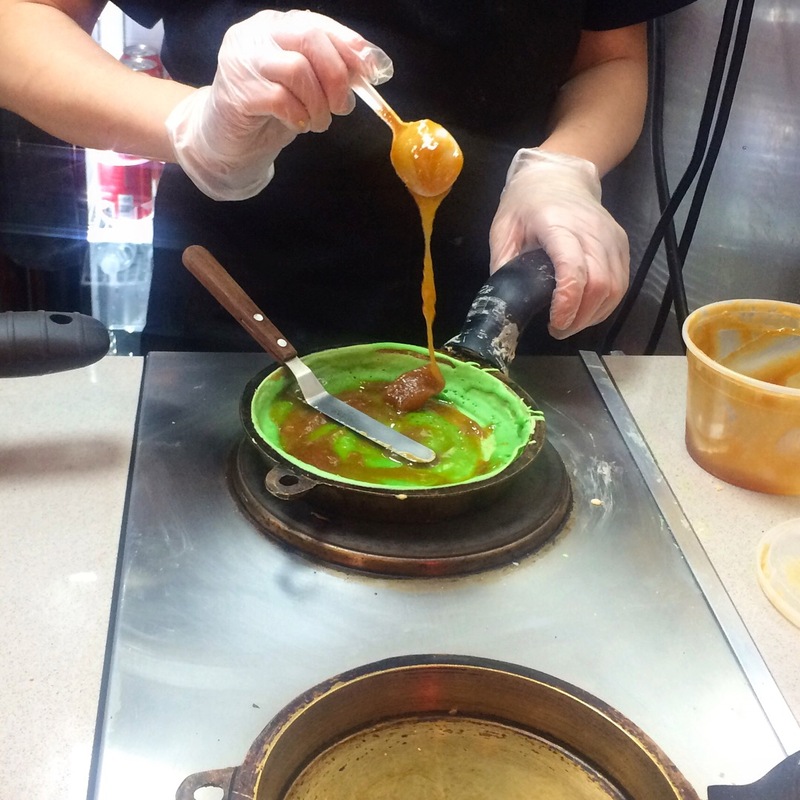 Little House Café is an Asian fusion counter service venue with a few tables and remarkably delicious food. I’ve said it before: these folks definitely have their own spin on Malaysian food (even if this one is relatively Chinese) – and I like it! Back in the seventies (ahem), Saturday Night Live did a sketch about Scotch Boutique, a store that sold nothing but Scotch Tape. They carried a variety of widths and lengths to be sure, but that was it. Just Scotch Tape. 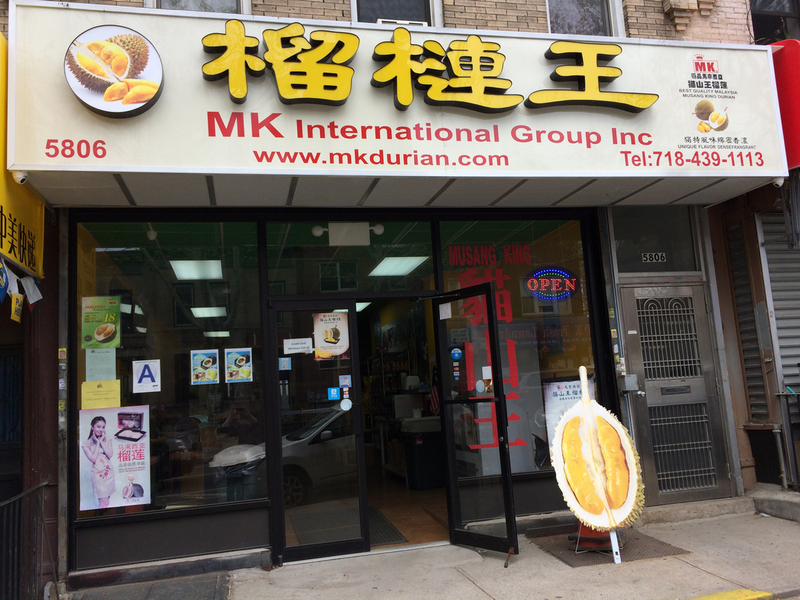 MK Durian Group at 5806 6th Ave in Sunset Park, Brooklyn sells nothing but durian. They carry a variety of cultivars and variations to be sure, but that’s it. Just durian. And the durian they carry is wonderful. You’ve probably heard the oft-quoted aphorism about it, “Tastes like heaven, smells like hell” (some would have the order of the phrases swapped but you get the idea), so much so that the fruit is banned from hotels, airlines and mass transit in some parts of the world. (And yes, I’ve been known to smuggle some well-wrapped samples home on the subway.) 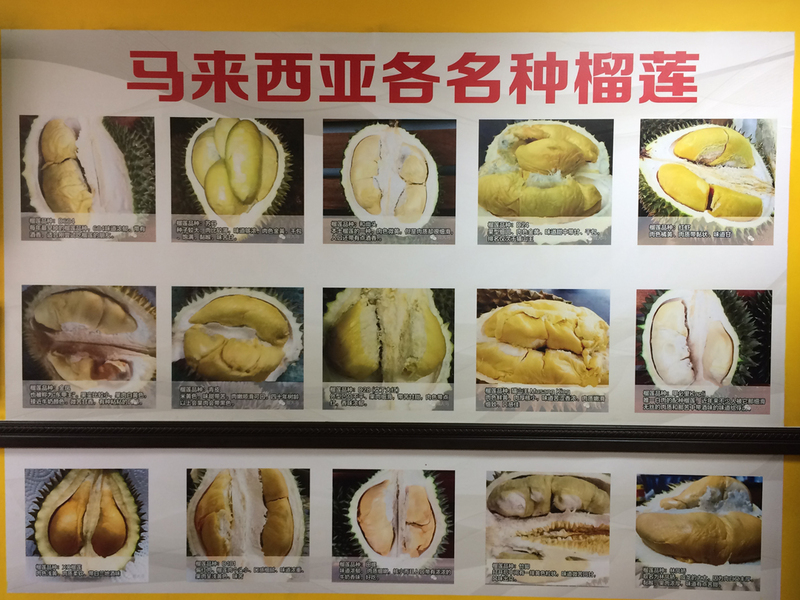 If you’ve never tasted durian, you might discover that you actually like it; a number of folks I’ve introduced it to on ethnojunkets have experienced that epiphany. 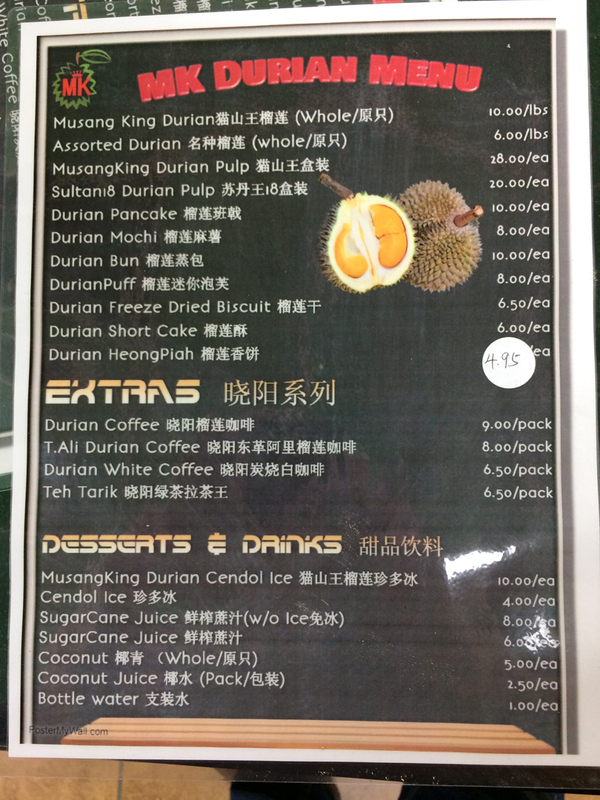 There are gateway durian goodies too, like sweet durian pizza (yes, really), durian ice cream, candies, and freeze dried snacks and they’re all acceptable entry points as far as I’m concerned. 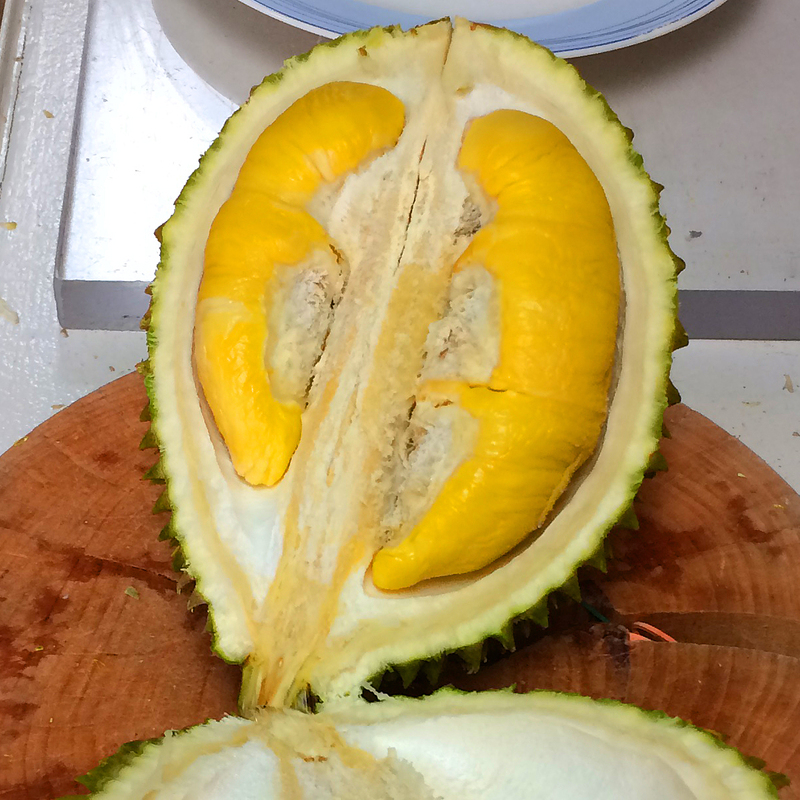 It’s difficult to pinpoint what durian smells like. The scent appears to defy description; I’ve encountered dozens of conflicting sardonic similes, but suffice it to say that most people find it downright unpleasant. Although I have a pretty keen sniffer, somehow its powerful essence doesn’t offend me although I am acutely aware of it – just lucky I guess, or perhaps I’m inured to it – because this greatly maligned, sweet, tropical, custardy fruit is truly delicious. 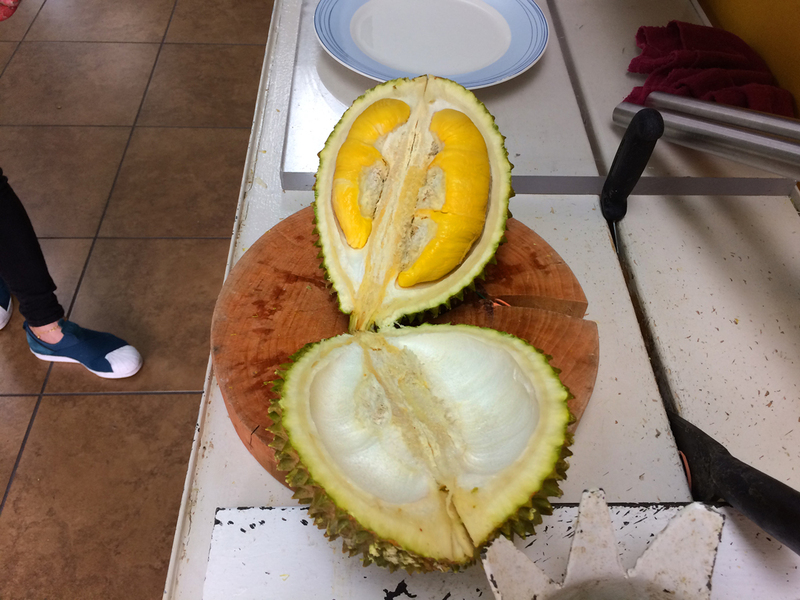 So I was thrilled to learn about MK Durian Group (aka MK International Group) from Dave Cook (Eating In Translation) whom I accompanied on a visit there. 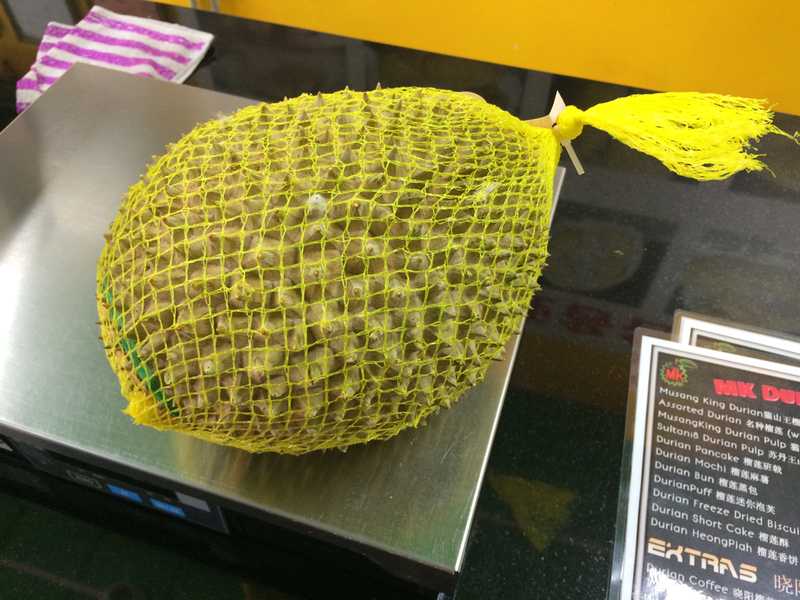 MK Durian Group works directly with plantations in Malaysia and is a wholesaler and distributor to restaurants and retailers in addition to catering to walk-in customers. We entered the commodious space with its many tables, all unoccupied at the time. Chinese-captioned signs showing photos of fifteen cultivars and another seven in English decked the walls along with a menu that, in addition to a price list for the fruit itself, included durian pancakes, mochi, and a variety of cakes, buns, and biscuits, a concession to the timid, perhaps. 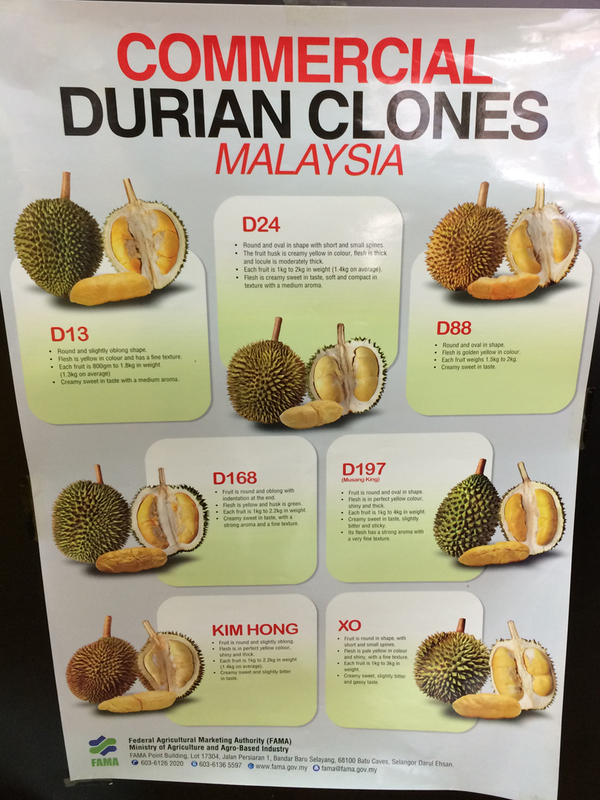 Durian cultivars are typically known by a common name and a code number starting with the letter “D”, so you might see Sultan (D24) or Musang King (D197), but sometimes you’ll find just the code numbers or sometimes just names like XO or Kim Hong. Scientists continue to work on hybrids to maximize flavor and minimize unpleasant smell. Fion, without whom I would have been at a complete loss, urged us to get the Musang King, often regarded as the king of the King of Fruits. She selected one from the freezer case and microwaved it for a few minutes to thaw it but not warm it up. Our four pounder, stripped of seeds and rind, ultimately produced about one pound of (expensive but) delicious fruit. Using an apparatus that looked a little like some sort of medieval torture device to crack the husk, she then adeptly removed the yellow pods; each pod contains a single seed that can be used in cooking like those of jackfruit. We took our treasure to one of the tables where boxes of plastic poly gloves were as ubiquitous as bottles of ketchup would be on tables at a diner. 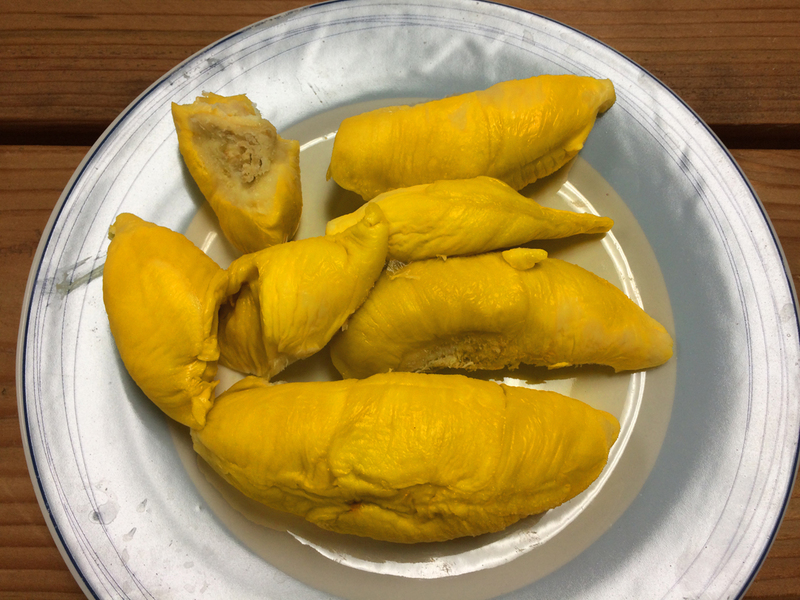 You may have seen durian in Chinatown in yellow plastic mesh bags where the fruit is often sold by the container and you don’t have to buy a whole one; you might conceivably experiment with whatever is available. But these were a cut above. As we left, I realized that something about the experience had been unusual: I asked Dave if he had noticed any of the customary malodourous bouquet. He replied no, but he thought perhaps he was a little congested that morning. I knew I wasn’t congested that morning. There had been no unpleasant smell to contend with. Had we stumbled upon that elusive golden window of odorless but sweet opportunity? Was that particular Musang King odor free? Or perhaps all of them in that lot? Did it have something to do with the fact that it had been frozen and thawed? We were beyond the point of going back and asking Fion, but I think it’s worth a return visit to get some answers! Three views of the same item from the grab ‘n’ go prepared food section near the register at Little House Café, 90-19 Corona Ave in Elmhurst, Queens. I assumed this would be the sweet Malaysian kueh (or kuih) that I had enjoyed elsewhere, in this case a pandan (green) and palm sugar (brown) rice flour/tapioca flour dense “custard”, but I was pleasantly surprised by the salty component of the pandan layer in contrast to the sweetness of the palm sugar layer. They’re shown flanked by eggy almond wafers, crunchy but not crispy, and a satisfying textural contrast to the kueh. 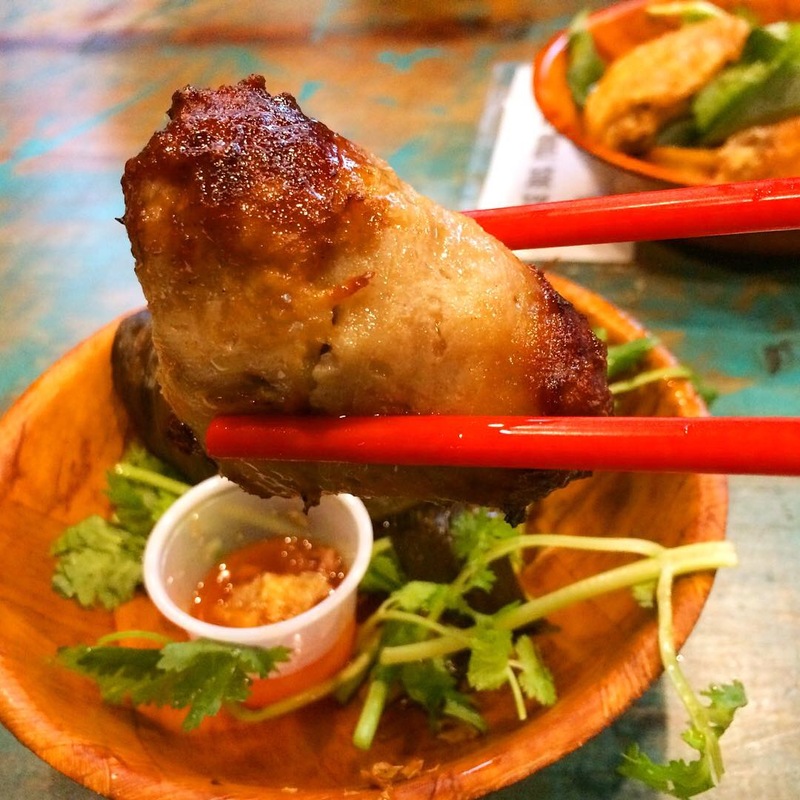 These folks definitely have their own spin on Malaysian food – and I like it! And see all the curry! Curry Chicken with Potatoes, that is. 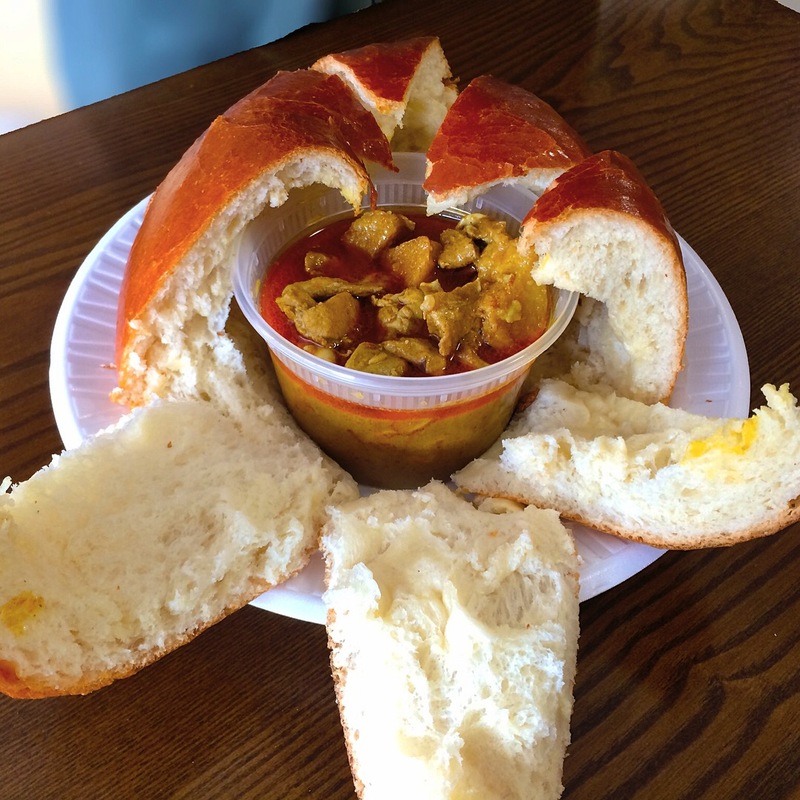 This is the mammoth curry chicken bun, identified as Golden Pillow on the menu, that you may have heard about and it’s as tasty as it is fun; remember that you need to order it a day in advance. (Note: we removed the curry chicken from the plastic and foil cooking pouch for the final photo; it made for easier dipping!) Little House Café at 90-19 Corona Ave in Elmhurst, Queens is an Asian fusion venue with a few tables and a delicious way with Malaysian food; I’ve raved about their Curry Mee with Young Tao Fu as well as their colorful multi-layered taro cake previously. When you go, don’t neglect their great baked goods and desserts to round out your meal or to take home for a midnight snack. 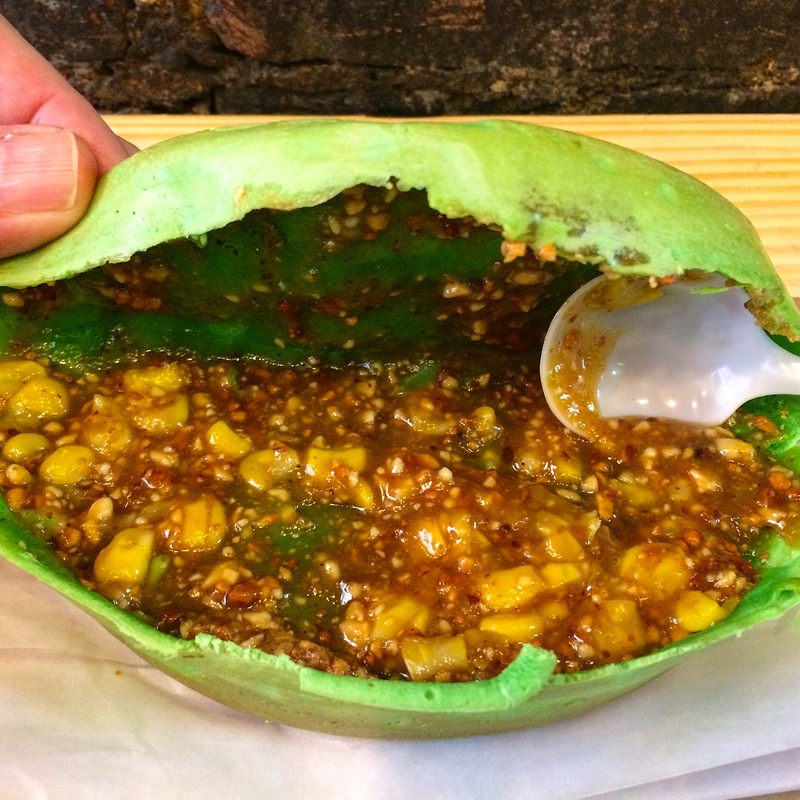 Let’s Makan (“makan” = “eat” in Malay), a newcomer to Manhattan’s Chinatown at 64A Bayard St, proves the adage that good things come in small packages. 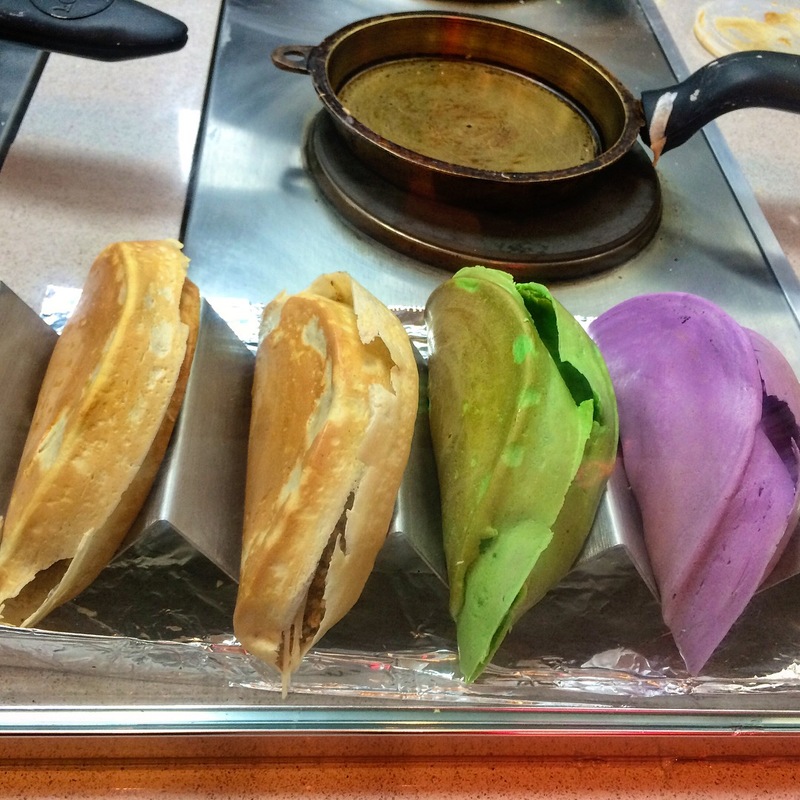 Every foodie I know is buzzing about this little snack shop’s Apam Balik, a Malaysian crêpe (available in traditional, pandan, ube, or chocolate), folded around a filling (your choice of butter, ube, Nutella, pumpkin, taro, or kaya), with toppings like peanuts, corn, toasted coconut flakes, cornflakes, or seasonal fruit. And if the decision sounds overwhelming, they have some tried and true suggestions for you like “Auntie’s Favorite”. 1) Open wide! 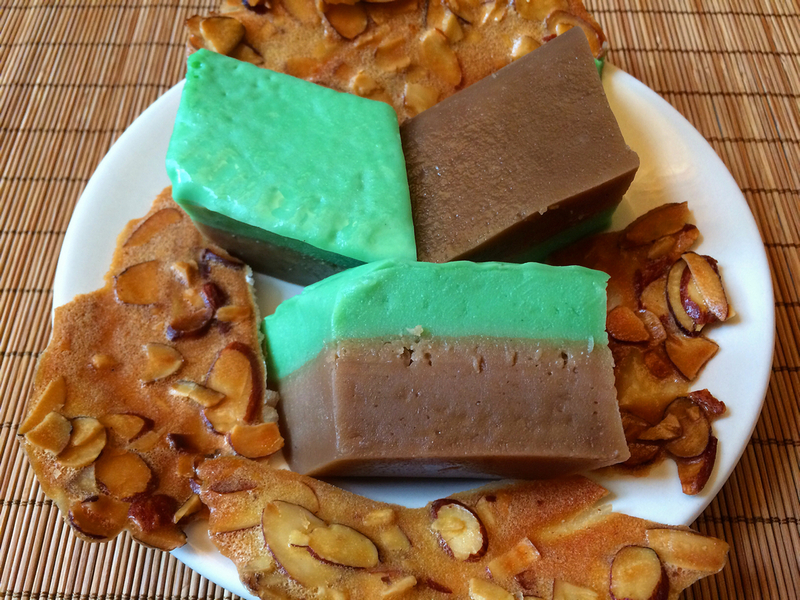 Here’s a peek inside my pandan apam balik with kaya (a jam made from coconut, eggs, and sugar), peanuts, and corn. 3) …lined up and ready to rock. Sweet and so delicious! Speaking with the enterprising owner, Michelle Lam, I was impressed with how passionate they are about bringing unique and authentic Malaysian flavors here; I’ll return soon to try their savory dishes too, like Pan Mee, Curry Chicken Rice, Nasi Lemak, and Flat Rice Noodle with a variety of delectable additions – more decisions! I highly recommend that you check out Let’s Makan as soon as you can; bring your appetite and don’t forget your sweet tooth! A place of many delicious wonders, I am compelled to return to Little House Café, 90-19 Corona Ave in Elmhurst, Queens as soon as possible. It’s an Asian fusion counter service venue with a few tables and remarkable food; in addition to having the best Curry Mee with Young Tao Fu I’ve ever tasted, the sweets and desserts were a cut above as well. 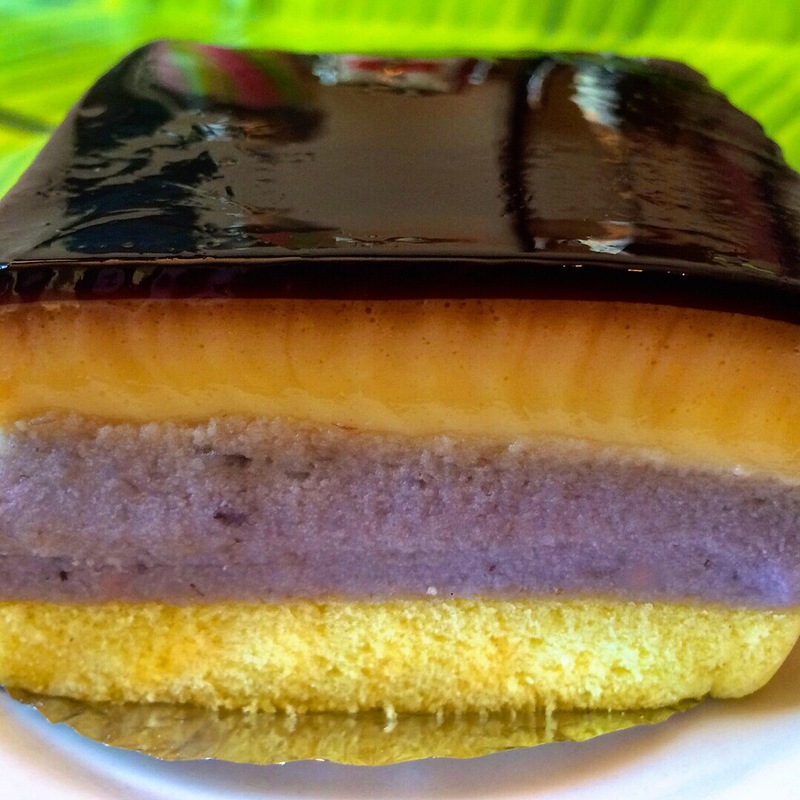 One of the most dramatic was this layered taro cake: gelatin, custard, taro, cake. Each layer brought something unique to the party: sweet, creamy, textured, fluffy. Remarkably, I was able to polish off the whole thing in one sitting because it wasn’t too sweet. …and the cutaway stepped view.